The Faculty Lounge: "Spouses for Life"
Here's to Phyills and Dell, on the left, Stephen and John, image below, and the many, many other happy and committed couples who are right now preparing today to take their vows of marriage tonight. 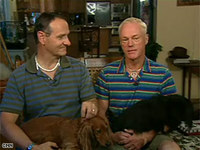 The California ruling that began the end of marriage discrimination in that state takes effect at 5:01 PST. 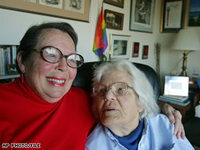 Partners for 55 years, Phyllis and Del established the first lesbian rights organization in San Francisco in 1955, laying much of the groundwork that would eventually make the California decision possible. Del's daughter told the San Francisco Chronicle: "It's really a big deal for them and for me to have this happen at this point in their lives . . . It's like icing on the cake and a reminder of how far we've come." Stephen and John have been together for 18 years. "I just feel like I want to be part of the fabric of American life . . . . We're just good American citizens that want to live the American life," John told CNN on Sunday. News reports say that Phelps and his crew are lining up to spew hateful thoughts and defend their idea of "traditional" marriage. I'm usually outraged by their vitriol, but this morning can't help but shrug them off and think, "so what." This day, this tradition, belongs to Phyllis and Del, Stephen and John, their friends, their family, and well-wishers from afar who celebrate the new journey they embark upon tonight when the Mayor pronounces them "spouses for life." No one is mentioning this.. but both the state and federal government will save $$$$$ with gay marriages on social security benefits!! !